1. What is Free Range? There are three basic definitions of free range (as it applies to chickens). One is correct; two are bogus. 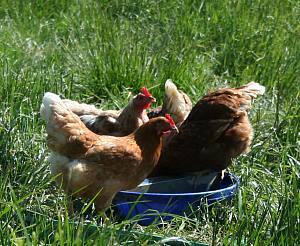 Free-range poultry are, for practical purposes, unfenced, and are encouraged to spend most of their time outdoors, weather permitting. Right on cue, our hot, dry August weather transitioned into cooler, cloudier weather with a little rain—just as you’d expect in Oregon.